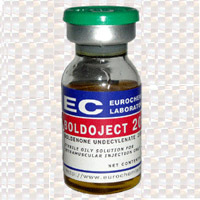 Despite its perfect characteristics, Boldenone Undecylenate (also Equipoise) is not officially approved for human use. Therefore it is considered as veterinary substance. Nevertheless due to the low price and high quality many bodybuilders willingly use it in their cycles. 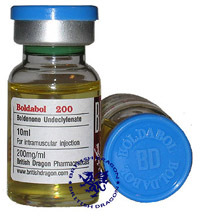 Boldenone belongs to testosterone derivatives. It possesses high anabolic properties and relatively low androgenic ones. It makes a gradual gain of muscles and strength, and improves relief. For optimal results Equipoise should be used with other compounds. BoldoJect is stronger and a little more androgenic than Nandrolone Decanoate, therefore it can replace Nandrolone in different cycles. It can greatly increase the quantity of erythrocytes, though not to such extent as EPO does. This effect positively influences endurance and also increases appetite. Equipoise remains activity for quite a long period of time. For athletic purposes it is injected every other day to keep the level of the hormone steady. The usual dosage is 400-600mg/week. It is not recommended to exceed 600mg a week. The bulking cycle with boldenone usually lasts for 2.5-3 months. One should also mention that short-term cycles are not so efficient due to slow effect of this steroid. In order to gain mass you should combine Boldenone with Dianabol, Anadrol or injectable testosterones, such as Sustanon or test. cypionate/enathate. It can cause great gains with less side-effects (in comparison with standalone usage of these compounds). The example of the cycle is the following: boldenone 400mg/week + testosterone 250-500mg/week during 10-12 weeks. Boldenone is also used for cutting cycles due to its low level of aromatization. By combining it with such compounds like Proviron, Winstrol, Parabolan or Halotestin you can greately increase the hardness of muscles. Here is a good combination for cutting purposes: boldenone 300-500mg + nandolone phenilpropionate 300-500mg during 1.5 – 2 months. For cutting purposes you can also use it at the end of a long cycle: Equipoise 100-200 mg/week + winstrol 50mg/day during 6 weeks. As Equipoise induces the synthesis of erythropoietin, it consequently increases the quantity of erythrocytes, and hence influences endurance. This effect is quite important in different types of sport. Boldenone is known for its low level of estrogen transformation (about 50% as compared to testosterone). Therefore estrogen related side-effects are moderate. Nevertheless in case of overdose it may cause gynecomastia in estrogen-sensitive users. Such users are recommended to take tamoxifen or clomiphene. There is no need in more powerful anti-estrogens. Androgen-related side-effects are possible in case of high doses. They include oily skin, acne, hair loss etc. Proscar or finasteride will not help in this case as they affect different metabolic pathways. So the best advice here is “do not overdose”. Reduction of natural testosterone synthesis and sexual dysfunction may also happen. Therefore it’s better not to use this drug standalone. To avoid testosterone collapse HCG and Clomiphene/Tamoxifen will be needed as post cycle therapy compounds, especially in the case of long-term cycles. In order to avoid abscess you should always change the spot of injections. Don’t use one and the same injection site more than once a week. Do not exceed 3 ml in one injection. One should remember that boldenone undecylenate can be detected during a period of 5 months from last injection. This is due to high solubility of the compound in fats. Therefore boldenone can be stored in body fat for a rather long period of time. Female athletes can use it at the dosage 50-75mg/week. The highest dosage for women is 150mg/week.